A standing room only crowd estimated at about 150 people turned out for a three-hour "Town Hall" meeting in Carroll Gardens last night organized by Council Member Bill de Blasio. Representatives from the Mayor's Office and the Landmarks Preservation Commission attended, as did Assemblywoman Joan Millman. One strategy that may be emerging is the concept of an "interim moratorium" on some development in the neighborhood while a rezoning study is underway. One of the biggest concerns in the neighborhood is that a rezoning and expansion of the Carroll Gardens Historic District will take so long that a great deal of development could take place that will fundamentally alter the neighborhood. Some of the issues that had been slated to be discussed at a Community Board 6 Committee meeting that had been scheduled at the same time as Mr. de Blasio's Town Hall were tabled and will be rescheduled. GL could not attend the meeting, but special GL correspondents reported back with a great deal of detail about the session. "I was really impressed with how the neighborhood all seems to be on the same page on this one," one of our correspondents wrote after meeting wrapped up. "People are realistic about that you can't stop new buildings and that they are needed. It's just that it needs to be monitored." Miller has done quite a bit of homework and explained this interim moratorium would be needed in order to study the consequences to the infrastructure in Carroll Gardens of the current overdevelopment. Miller mentioned in particular "safety concerns" and called Carroll Gardens the "wild west" when it comes to development and construction. She said she found over 40 stop work orders in Carroll Gardens buildings going on right now, and mentioned that at 360 Smith Street a violation already exists for construction without a permit. The recent roof collapse in Carroll Gardens was also discussed that as another example. Mr. de Blasio seemed impressed with Miller's points and he agreed that this interim moratorium could theoretically coincide simultaneously with the re-zoning study...he agreed to a review the possibility of an interim moratorium saying Miller, (staffer) Tom Gray and he would work together on it ASAP. Infrastructure was brought up by several other speakers at the meeting (there was a long list of speakers...it was a sort of "open mike" and anyone who wanted to speak could sign up on a list. At the end, questions were taken from the rest of the audience. Sanitation, schools, traffic, safety concerns were all mentioned among other issues. The issue of the controversial building at 360 Smith Street that helped push the Carroll Gardens rezoning discussion came up repeatedly, including the issue of finding a way to use an interim moratorium to impact some of the zoning peculiarities of the neighborhood, such as one that includes the big front yards of buildings as part of the definition of "wide streets" that allow developers greater densities. Residents also returned to the controversial topic of the developer's plans to cut down the trees in the public plaza at the entrance to the Carroll Street subway station. (The trees were planted with public funds.) Neighborhood leader Barbara Brookhart argued that the plaza should be protected and our correspondent reports that "Mr. deBlasio did seem more receptive this evening" to such arguments. 360 Smith developer Billy Stein, who did not attend, is reportedly going to submit a revised building plan next week. One of our correspondents reports that he "apparently was affected by the neighborhood reaction and is going 'against' what his 'people' are advising him to build." 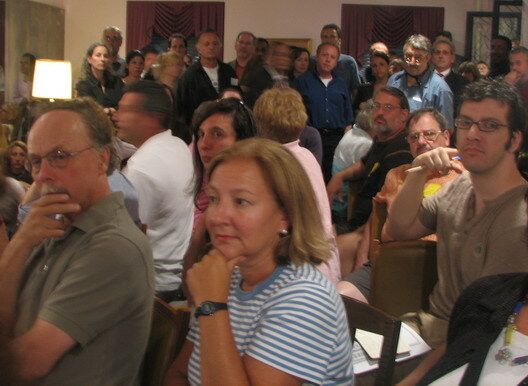 Other development projects that came up in the discussion included the big development planned at the toxic Public Place site (which is still opposed by some residents) and the possible tall building at the International Longshoreman's Association building site at 340 Court Street that would be possible under current zoning. A Third Street resident noted that the owners of a garage across the street from the 360 Smith Street site "do, in fact, intended to develop their corner...and have removed the gas tanks from the ground already and are 'waiting to see what happens at 360 Smith Street.'" Residents voiced concerns about the fate of neighborhood blocks between Hoyt and Bond Streets, which might be part of the upzoning being developed for Gowanus that could allow buildings as tall as 10 or 12 stories on blocks where most buildings are now two or three stories. Marlene Donnelly of Friends and Residents of Greater Gowanus (FROGG) noted a host of issues associated with Gowanus development generally, including a wide range of toxic issues and the flooding that occurs around the canal during rainstorms, such as the August 8 storm. Mr. de Blasio noted that the community session is the first of many that he is planning. He noted that the downzoning of Carroll Gardens will take about two years, but that the City Planning Department is committed to studying the issue. He again noted that downzoning and expansion of the landmark district should happen at the same time. this fight to develop Carroll Gardens while retaining it's flavor as his ticket to greatness," one of our correspondents observes, noting that there was "lots of well-informed cynicism directed toward him." The Council Member said that he will host a series of meeting about Carroll Gardens zoning and development issues in coming months. UPDATE: You can also read great coverage of the meeting over on Brownstoner today and on Curbed. UPDATE II: City Planning Director Amanda Burden previously indicated in a letter to the Carroll Gardens group CORD that a development moratorium would have to go through the city's land use review process. She wrote, "Please note that any moratorium, whether temporary or permanent, is required by law to go through the Uniform Land Use Public Review Process, as well as an environmental review." Have You Met the Sophia Lofts on Roebling?